Blazed: To Vape or Not to Vape? Being an athlete and believing in the benefits of cannabis can be a fine line to walk. Not only do coaches, schools, and the NCAA condone (piss test) cannabis use, but smoking weed can also hinder endurance due to lung inflammation and scarring. During my football playing days I learned the benefits of vaporizing cannabis as opposed to smoking blunts and joints. Wind sprints were far easier after beginning to vape. It was easier to hide my intoxicated state because cannabis vapor doesn’t smell and leads to a clearer controllable high. Even after hanging up the cleats, my meditative hikes in the woods, workouts in the gym, rides on the back roads, and floats on the river are always accompanied by a well-timed vapor puff. Today, here at HU, we are on the vapor bandwagon. Although we enjoy the occasional blunt, spliff, bong rip, or joint; we see vaporizing cannabis as far a superior ingestion method than smoking. Not only is vaporizing healthier for those who partake but HU has learned that vaporizing your stash has fringe benefits such as controlling ones high, cleaner taste/high, edible ABV (Already Been Vaped), and no smoke smell! It has been well documented that vaporizing cannabis is far healthier than smoking. In fact the DEA, in a semantic slight, continues to cite these studies, pronouncing that there are no health benefits when smoking cannabis – they must have forgotten about the vapor part of the study… But they have a point because anytime combustion is used to burn cannabis – or anything – hydrocarbons, carcinogens, and toxins are present. CA Norml reports – using data from a study published in the Journal of Cannabis Therapeutics – that combusted cannabis produces over 100 chemicals that are not present in cannabis vapor. Using a gas chromatograph mass spectrometer (GCMS) researchers determined that cannabis vapor contains 95% THC with trace amounts of CBD with the remaining percentage made up of flavinoids and terpenes. Combusted cannabis was shown to contain as much as 88% non-cannabinoid compounds – that only leaves 12% for the good stuff! All in all, findings demonstrate that cannabis consumers can all but mitigate ill effects of smoking cannabis by using a vaporizer! Check out this cool visual by weed maps (Above – or Click for full view). In addition to mitigating ill effects of smoking cannabis, vaporizing cannabis has additional benefits. For instance, as Chuck Lenatti points out in Why Vape? A Cooler Way to Consume Cannabis (Cannabis Now Magazine), “unlike combustion, which releases all of the psychoactive chemicals simultaneously… [vaporization] allows the active ingredients to be released gradually.” Terpenoids (smell and flavor) vaporize at 246˚F, THC vaporizes at 315˚F, CBD vaporizes at 320-356˚F, and CBN vaporizes at 365˚F. Toxins are released at 392˚F. So what does this all mean? With a digital vaporizer one can control the temperature and dial in their high. Here at HU we like to set our vaporizer at 315˚F earlier in the day and closer to 365˚F later. A pure THC high, in low doses and with the right strains (sativa) can lead to an extremely uplifting, productive, and active high (a great writing high!). Conversely, dialing the vape to 365˚F latter in the day (with indica dominate strains) is great for watching a movie and winding down. 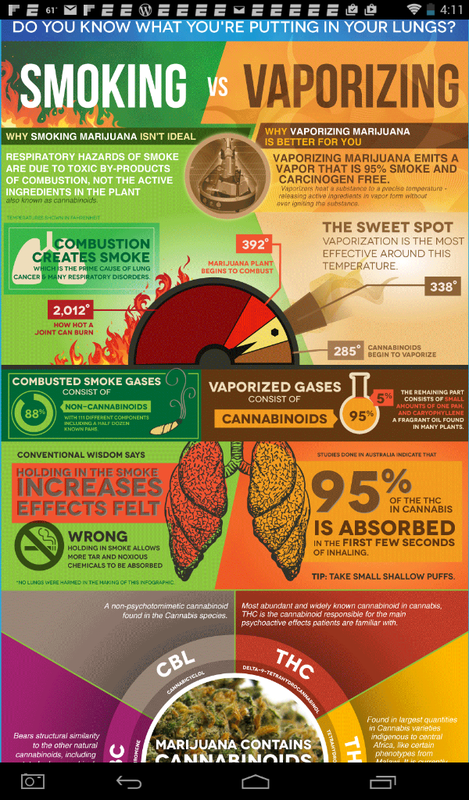 Sticking to these numbers when vaporizing can lead to additional benefits. For one, as Emerald Cup judge Nikki Lastreto pointed out (Underground Review Sept 1st), taste and smell are probably the most important categories when judging cannabis. However, when smoking cannabis, smell and flavor is distorted by the combustion process. Additionally, because of all the chemicals associated with smoking cannabis, vaporizing offers a clearer high reflecting the plants compounds and not compounds produced during the combustion process. Then theirs ABV, Already Been Vaped, as Chuck Lenatti calls it. If you stick to a lower vaporizing temp and don’t fry your weed it can be used to sprinkle on food as a on the go edible. Because the cannabis has been heated, it is now psychoactive and ready to eat. 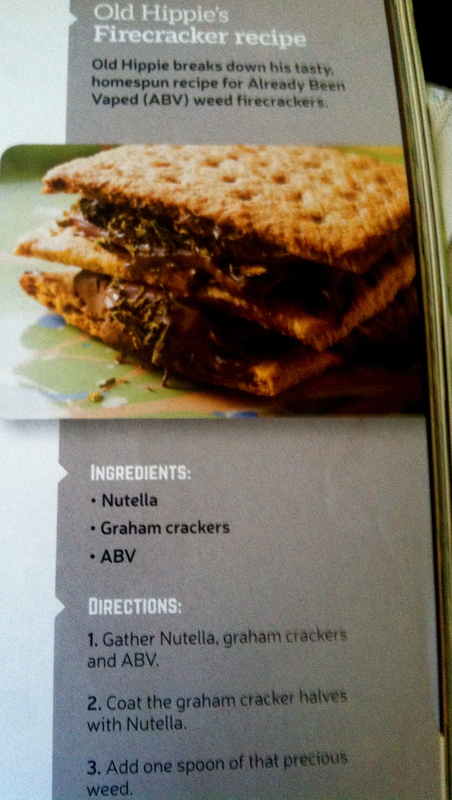 In Cannabis Now magazine Chuck leaves us a recipe he calls Old Hippie Firecrackers – a little Nutella on a graham cracker, a sprinkle of ABV, and instant edible! In sum, if one is wishing to be a connoisseur of cannabis, a vaporizer is mandatory. Smoking just doesn’t cut it. There are too many benefits associated with a quality vaporizer. We recommend Vapor Bros! This entry was posted in Health and tagged Alternative Medicine, Cannabis, Harm Reduction, Health, Humboldt, Public Health, Substitute, Vaporizing, Vaporizing vs Smoking. Bookmark the permalink.